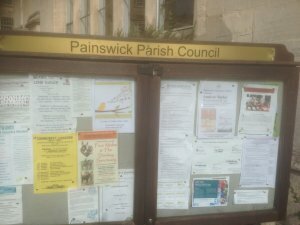 The Parish Council have notice boards in each of the Wards; outside the Town Hall in Painswick, by the bus stop in Edge, Steanbridge in Slad and by the Village Hall in Sheepscombe. If you wish to include a notice for a local event; then just post in the letter box at Painswick Town Hall and provided we have room we display it for you (note the notice boards are normally updated on a Friday morning). There is also a Notice Board in Stamages Lane car park for business; please contact Peter Rowe on 01452 813228 for further information.